From Wikipedia, the free encyclopediaYeardley Smith (born July 3, 1964) is a French born American actress, voice artist, writer and painter. She is best known for her long-running role as Lisa Simpson on the animated television series The Simpsons.She was born in Paris, France and moved with her family to Washington, D.C. in 1966. As a child, Smith was often mocked because of her unusual first name and her voice. She became a professional actress in 1982 after graduating from drama school and moved to New York City in 1984 where she appeared in the Broadway production of The Real Thing. Her first film role came in 1985's Heaven Help Us, followed by roles in The Legend of Billie Jean and Maximum Overdrive. She moved to Los Angeles, California in 1986 and received a recurring role in the television series Brothers. In 1987, she auditioned for a role in a series of animated shorts about a dysfunctional family on The Tracey Ullman Show. Smith intended to audition for the role of Bart Simpson, but the casting director felt her voice was too high so she was given the role of Lisa instead. She voiced Lisa for three seasons on The Tracey Ullman Show, and in 1989, the shorts were spun off into a half hour show called The Simpsons. For her work as the character, Smith received a Primetime Emmy Award for Outstanding Voice-Over Performance in 1992.Alongside The Simpsons, Smith acted in the sitcom Herman's Head as Louise, and had recurring appearances as Marlene on Dharma & Greg, and Penny in two episodes of Dead Like Me. She has appeared in several films, including City Slickers, Just Write, Toys and As Good as It Gets. In 2004 Smith performed her own off-Broadway one-woman show entitled More at the Union Square Theatre in New York City. Aside from The Simpsons, Smith has recorded few voice over parts, only commercials and the film We're Back! A Dinosaur's Story. Smith starred in and served as executive producer for the independent relationship comedy Waiting For Ophelia, which had its world premiere at the Phoenix Film Festival in April 2009.Smith was married to actor Christopher Grove from 1990 to 1992 and Daniel Erickson from 2002 to 2008. She enjoys writing and painting. During the first season of Herman's Head, Smith taught herself to paint by copying other artists. 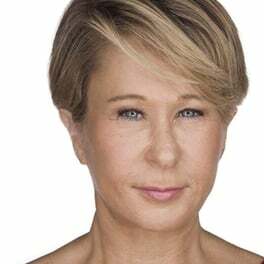 She released a children's book titled I, Lorelei in 2009 and her story The Race was included in the book Just Humor Me.Description above from the Wikipedia article Yeardley Smith, licensed under CC-BY-SA, full list of contributors on Wikipedia.